Learning how to plan an event is no easy task, it requires a lot of trial and error. I have been doing events over the past 12 years and have realised different things required to do them well. Over the past 4 years, my focus has been hosting and speaking at Business and Personal Development events. 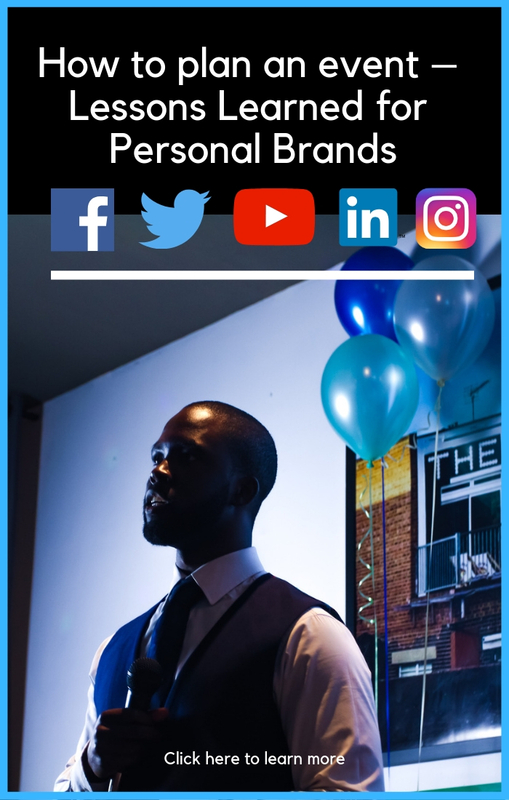 In this article, I am going to focus on the key things required in order to put on a good event, especially as a personal brand. A good event requires you to know your audience well. It’s better to grow an email list, network or social media community first. Then provide value to them by surveying them before the event. Afterward, it’s about developing the right content for the event. You also need to find the right venue and use the right ticketing system for your event. And finally, it’s about tying it all together to make sure everything is working like clockwork. Digital marketing has been the talk of the town, especially in this internet age. People are trying to find ways to avoid talking to people face-to-face. However, the best way to market anything is face-to-face. People prefer the nuances of getting to know, like and trust you in the flesh. One of the fastest ways to market yourself, products and services are via events. I have seen people make £3 million in 60 minutes, after a great keynote speech. I’ve witnessed people growing their email list by the 100s because of an event. If you want speed in your business, develop or be at a high-quality event. I would argue it is one of the best ways to market yourself, especially now that they can be filmed and redistributed globally. Before you start any event, you need to be able to know the people that you are serving. Understand their key problems early on and develop content that can easily be searched for, and helps to resolve their problems. Your primary way of doing this should be via content on your website and YouTube, and secondary ways include social media platforms. Your aim is to produce as much high-quality content as possible (organic or paid), on a very regular basis. Your next step is then to convert these users into leads. This is done by providing a lead magnet in exchange for their email information. The more attractive the lead magnet, the more likely they will convert. Send them a simple questionnaire that answers a few questions. If you can’t do this, you may want to ask these questions when an attendee is registering for an event. It is a great way to capture user data and can inform the direction of the event you are planning. Conversely, if you don’t have an email list, you could potentially survey your social media following instead, or people in your network. The aim is to get primary information from your audience. Of course, you can add and remove things like icebreakers, activities, and speakers etc. but that should be dependent upon what you think would be appreciated. It’s about providing value, but not exhausting people at the same time. You need to strike the right balance. Running an event by yourself can be stupid. I would know because I have done it many times before. However, it depends on the event! There are so many hats to play, but you want to spread the risk the right way. You need people who are reliable and on task. Now that you know who you want to involve in the event, it’s time to book the location, venue date and time. This is crucial because this could determine the success of your event. Your venue should be situated in a place that is easy to get to and has minimal hassle. Think about the nearest tube and bus stations available. The venue needs to be suited to your crowd. Are you going for a professional look or more of the creative look? Regardless, think carefully about the feel of the event. Do a search for venues online like hirespace and look at the prices. Then decide on entry fee dependent upon your marketing strategy and purchasing power. If your venue costs £500 are you willing to pay £500 and gain no return? In other words, would you host a free event aiming to increase brand awareness? Or will you charge £10 on the door hoping to get 50 attendees at a minimum? If no one knows your brand, you need to think about how in demand your niche or topic area is. This is why it is sensible to grow a community first, attend and speak at other events and grow your email list. If that isn’t the case for you at the moment, there’s no harm in trying, it’s the best way to learn what works. You may use a different platform to post your events however Eventbrite is cheap and easy. They make money from “administration fees” taken out as a small percentage from ticket sales. You can easily add your bank details so that profit can be deposited in your account 5 – 10 working days after your event. What is even better about Eventbrite is that is has a lot of custom features such as email integration, analysing reports and developing custom questions upon checkout. You know your audience’s concerns based on prior research, it’s time to build content around it. Of course, this is dependant upon the style you are going for. You want to keep it simple. Introduce the event with brief background information and the aim of it. Proceed by introducing the speakers, or conducting an icebreaker. You can have a number of speakers running between 15 – 30 mins dependant upon your event. You can also break up these talks with more icebreakers and/or entertainment. You may end the event with a Q&A session, award ceremony or an activity where the audience could win attractive prices. Each slide should pertain to the agenda and run in a logical order. Use nice pictures (royalty free) from Unsplash and stick to a consistent brand. You may also want to think about an offer you want to sell at the end. Whatever you do, practice your presentation until it feels comfortable. Every successful person has a system, whether it seems obvious or not. The best system to have before running any event is a checklist of actions, tools, resources, contact information etc. You’ll be thankful for this on the day. Give this checklist to a responsible “somebody” who can keep everyone in line. This could create a really smooth event for you. Remember, even if 10 people come you need to treat it like 2,000 are coming. Assurance is key for success. With this in mind, it’s important to note what you need, what you have and what you need to get. WRITE DOWN EVERYTHING! And tick off what you have when you put in a dedicated bag for the event. Resources will include DSLR cameras, camera stands, lapel mics, lights, smartphones and phone holder, laptops, HDMI lead and adaptors, mics and jack leads. This is obviously a more technical list but there is also other things like drinks, snacks and food, as well as decoration, stationery, goody bags and other stuff. Think about your budget and think about what would be useful for the event. Also, don’t forget to communicate with your attendees. Email them useful information a week and 1-2 days before the event. Get to the event at least 2 hours before doors open!! It is crucial that everything is in place and that you are relaxed and calm. There are too many situations where I have got there an hour before and I felt rushed. Think about what you need to do. There are some things you can only test on the day of the event, so you need the time to do this. Dependant upon your venue you may need to pay for this additional time. Factor this in as early as possible. Remember you need to test technical equipment, potential faults with the venue and space. Anything could happen! Don’t panic! Trust the process. It’s event time and there’s no going back. Trust that everyone will do their job, and if they don’t it’s a lesson to learn for next time. If someone makes a mistake, improvise and do not aim to embarrass anyone! This will read badly in front of the audience, and it doesn’t do well for that person’s self-esteem. Do not try and play many hats, it is exhausting and draining. Have fun, and be in the moment! The event is done but it’s still not over yet. It’s time to make your observations known and evaluate the event with your team. Celebrate your wins, but make known your challenges. You can choose to do this at the venue, or over dinner in Nandos on the same day! Whatever you do take note of everything and implement what you can for next time. This is so important for your success in the future. An iterative approach is what helps you improve in the long-run. Write up a personal thank you email to all your speakers and volunteers making it personal. They are the reason why your event was a success. Furthermore, you want to also write an email to all attendees. This should include a brief summary of the event highlights, things learned and next steps. These next steps could include looking out for more emails, updates on future events or products and services you have on offer. It’s important to email your list regularly and keep in touch with them. Check out this article to look at how you can do this. To conclude an event can be a great way to generate income or get brand awareness. However, it takes planning, strategy and humble execution. Don’t be scared to hold an event on a regular basis, it may be the best thing that has happened to you. Make sure you get video footage of your event in some capacity. It’s a great way to leverage the value provided at the event. Read this article as a reference to developing an event that delivers results!